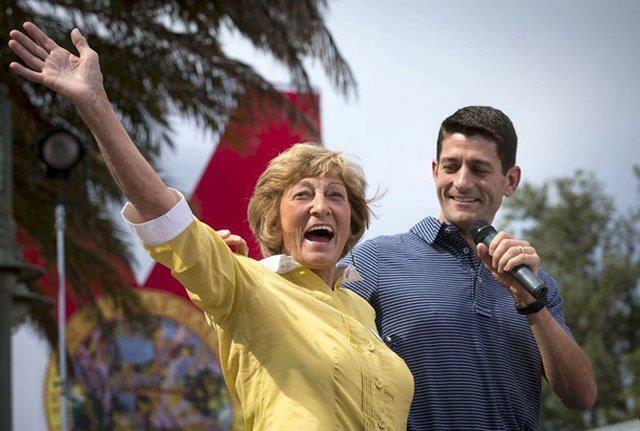 Paul Ryan introduces his mother Betty Douglas at a campaign event at The Villages in Lady Lake, Florida August 18, 2012. Mom, I am proud of you for going out, getting another degree. I’m proud of you for the small business that you created. And Mom — you did build that!! That’s what America is all about. You know, my grandma moved in with us—with my mom and me—when I was in high school. She had advanced Alzheimer’s. My mom and I were her two primary caregivers. You learn a lot about life; you learn a lot about your elderly seniors in your family; you learn a lot about Alzheimer’s. Medicare was there for our family, for my grandma, when we needed it then; and Medicare is there for my mom while she needs it now, and we have to keep that guarantee. This entry was posted in 2012 Primary, Budget, Health Law, Obama, Paul Ryan, True Talking Points and tagged travel. Bookmark the permalink.